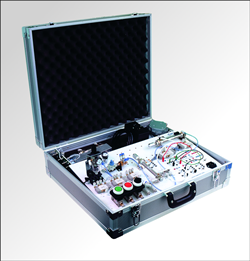 PNEUMATE-200 is the light and portable training equipment to help users discover more about pneumatics and electro-pneumatics technologies. PNEUMATE-200 is available in 5 options. The equipment is comprised of a panel with pneumatic and/or electro-pneumatic components depending on the option selected. All the options include the panel with components and screen printed symbols, all the extras required as well as the full documentation. Find out more about this didactic equipment and the available options in PRODUCTS / PNEUMATE-200.